Now back in stock! Open almost anything with this fantastic bits set! 75mm long for getting to those recessed screws, bit set includes: - 9-pc. star bit set in sizes T8H, T10H, T15H, T20H, T25H, T27H, T30H, T35H and T40H. - 6-pc. hex bit in sizes 2, 2¼, and 3-6mm. - 3-pc. 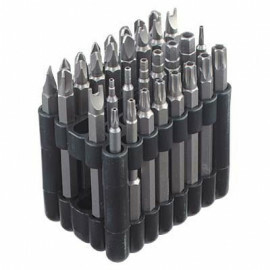 torque bit set (6, 8 and 10mm), - 4-pc. spanner set #*40;4, 6, 8 and 10mm), - 4-pc. tri-wing set (1-4mm), - 3-pc. pozidriv set (N1-N3), - #1 and #2 Phillips bits - 6mm slotted bit. All bits constructed of long-lasting, rugged chrome vanadium steel.